Over half a century, the soles of thousands of shoes left their mark on one of the remaining relics of a once booming energy and electric Municipal District of Bighorn community. Even after all the years of dirt smudged stains and icy snow clumps being dragged over it, and anything else the bottom of a pair of shoes can transport, the smiling face of the Reddy Kilowatt logo, with its light bulb nose and electrical outlet for an ear, greeted Bow Valley visitors for decades – and will continue to do so. 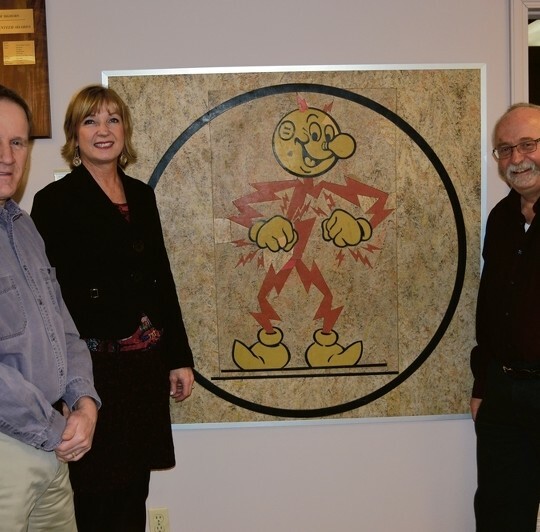 Reddy Kilowatt, an internationally recognized registered trademark to promote electrical appliances since 1926, lay in place on a floor in a staff house for Calgary Power (now TransAlta) in the Seebe settlement from the late 1950s to late 2000s. Love seeing this article. It’s a fabulous relic.